The Sewists are a new breed of designer-makers. From jewellery to bookbinding, felt craft to embroidery, screen-print to dressmaking, they encompass all areas of art and craft, and often combine techniques in new ways. 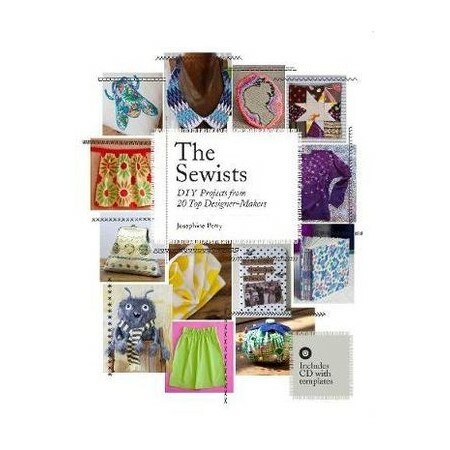 Author and fellow sewist Josephine Perry has interviewed 20 designers about their working life and inspiration, and persuaded each one to part with a project for readers to make. Projects include a cameo brooch using freehand machine embroidery, a fun fur and felt creature, a circus troupe decoration, block-printed napkins, subversive cross stitch and many more. Each project is clearly explained and includes step-by-step illustrations and specially commissioned photographs of the finished piece. Also included is a CD containing templates, stitch charts and a blouse pattern - everything you need to complete the projects in the book. Anyone who enjoys sewing and crafts, and can use a sewing machine, will relish The Sewists. Josephine Perry is a designer-maker and sewing workshop tutor based in London. In 2010 Josephine combined her love of making and her career in teaching when she began to develop and lead creative workshops for adults and children. She teaches regularly at Fringe and Liberty Sewing School. A champion of fellow designer-makers, Josephine also loves old things and firmly believes in makers sharing their traditional skills in an inspirational fashion.